Samsung Galaxy Note 7 Banned On Planes, Including In Checked Bags : The Two-Way The emergency order from the Department of Transportation bans the smartphones from aircraft for posing a fire hazard. All Note 7 devices are being recalled. The father of a Minnesota teenager says this replacement Samsung Galaxy Note 7 phone melted in her hand on Oct. 7. The Department of Transportation did not mince any words: Starting mid-Saturday, the Samsung Galaxy Note 7 will be "considered a forbidden hazardous material under the Federal Hazardous Material Regulations." That means the smartphone will join the same category as flammable aerosols, fireworks, lighter fluid and light-anywhere matches: not allowed aboard a plane, whether it's in your pocket, a carry-on bag or a checked suitcase. You simply cannot fly with it. If you do, the phone may be confiscated and you may face fines or worse — criminal prosecution for evasion of a federal ban. Airlines can deny boarding to people who don't give up their Note 7s. If someone is spotted with the device on a plane, the owner will be asked to turn it off and keep it "on their person" during the whole flight — not in a seat pocket, or a bag, or an overhead bin. "We are taking this additional step because even one fire incident inflight poses a high risk of severe personal injury and puts many lives at risk," Transportation Secretary Anthony Foxx said in a statement. 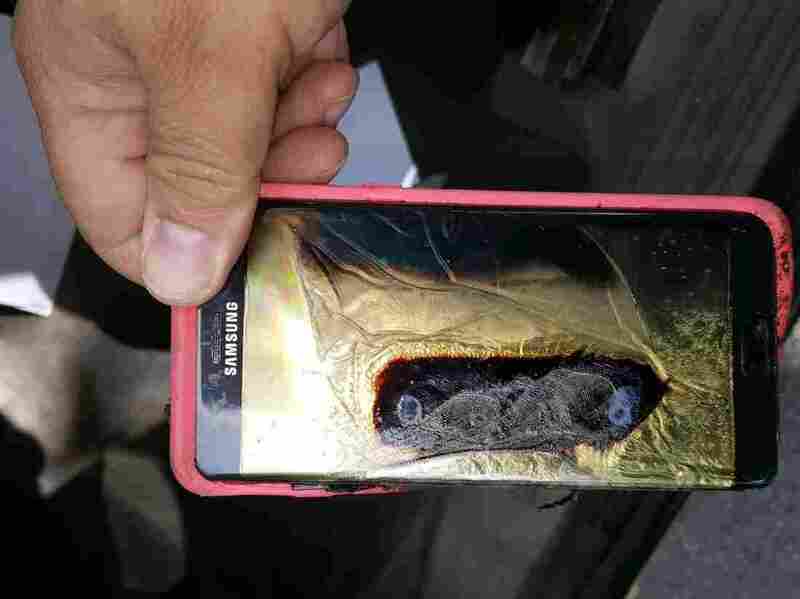 Samsung has now stopped making the Galaxy Note 7 as more of them catch fire. The company and the Consumer Product Safety Commission are pushing to reclaim every single Note 7 — including phones issued as replacements during the first wave of the recall. Samsung, in its own statement on Friday, said it is working with phone carriers and federal officials to relay the news of the flight ban to Galaxy Note 7 users. "We have encouraged airlines to issue similar communications directly to their passengers," the company's statement said. "Any Galaxy Note 7 owner should visit their carrier and retail store to participate in the U.S. Note 7 Refund and Exchange Program now. We realize this is an inconvenience but your safety has to remain our top priority." People have made dozens of reports of the smartphone's batteries smoking, catching fire and exploding — causing burns and property damage, including fires in cars and a garage. The company had linked the hazard to the phone's lithium-ion battery. As part of the original recall of the devices — 1 million in the United States, and 2.5 million globally — Samsung offered customers a replacement Note 7, which the company said had a battery from a different supplier. But later, smoke from a replacement phone prompted an evacuation of a Southwest Airlines flight, causing an expanded recall. Samsung and consumer product safety officials are investigating the cause of the overheating batteries.